A trip to all the wonders that Cape Town has to offer doesn’t mean turning your back on the chance to safari while in South Africa – one of the best countries in the whole of Africa for viewing the continent’s most iconic species, whatever your budget and however you prefer to holiday. There are other malaria-free safari options in South Africa if you are willing to travel, but the proximity of some of the safari locations to Cape Town make it more convenient overall. Where to Safari Near Cape Town? Just a two-hour drive (or 175 km) from the center of Cape Town, Aquila is one of the closest game reserves to Cape Town, making it a great place to take in the country’s more natural landscapes when holiday time is short. Despite this, you can still be sure of a traditional Big Five experience alongside an infinity pool, restaurant, spa and cigar lounge among other facilities. With a combination of 44 rooms spread over three floors of Aquila Lodge and some more private cottages too, Aquila is far more than merely a breathtaking experience encountering the Big Five close to Cape Town. The malaria-free reserve includes a newly constructed lodge consisting of 44 spacious double-occupancy rooms. Fully accessible by lift, standard rooms consist of queen-sized beds and en suite bathrooms in a modern chic style. Premier rooms include balconies that look out over the reserve and the magnificent Karoo mountain views, which extend into the bathrooms. Perfect for families or groups, the family suites are connected by a lockable common passageway. The other accommodation option at Aquila is its luxury cottages. Coming with their a private patio area, they also include a corner bathtub and outdoor rock shower. Located close to the children’s play area are the family luxury cottages, consisting of children’s beds on a mezzanine floor which overlooks the main bedroom. For a little more privacy, the reserve also includes premier luxury cottages, located on the hillside above the main lodge. Slightly further from Cape Town than Aquila at three hours and 15 minutes (256 km) by road, Sanbona in made up of environmentally-friendly five-star accommodation in luxury tented lodges with private spa baths, as well as a manor consisting of a private bar, swimming pool, and his and her bathrooms. The largest game reserve reachable from Cape Town, it includes a staggering 58,000 hectares. But what sets Sanbona apart from other reserves is its location among the beauty of the Warmwaterberg Mountains. 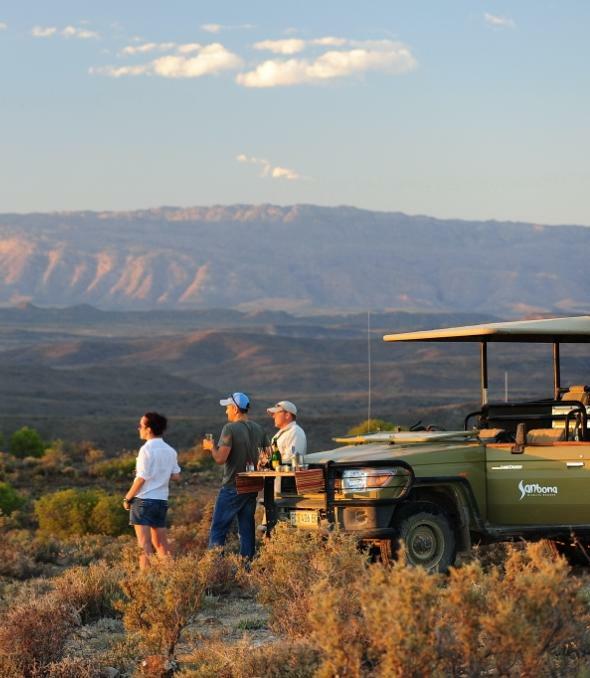 Situated in the arid Warmwaterberg Mountains of the Klein Karoo region, Sanbona is not only luxurious in its accommodation options, but also environmentally-friendly. One of the largest wildlife conservancies reachable from Cape Town by road, the 58,000-hectare estate is home to many of Africa’s most iconic species, from lion and elephant to rhino and giraffe. Tilney Manor sits in an oasis of carefully designed indigenous planting and offers those looking for tranquillity the perfect combination of privacy and facilities. Dwyka tented lodge, meanwhile, more closely represents secluded luxury than a campsite, with a handful of large wood and canvas buildings in a stunning horseshoe ravine. For a little more adventure, there’s also the seasonal Sanbona Explorer Camp, of more basic tented accommodation. Inverdoorn is located two and a half hours (200 km) from Cape Town, in the Klein Karoo region. Its Kuganha tented camp comprises just three 66 m2 luxury tents with sides that can be opened out to take full advantage of the incredible surrounding landscape. The room includes a dedicated area in which to relax, as well as a deck with a private plunge pool. The reserve also contains four Ambassador chalets and seven Tankwa chalets. Staying at one of the Ambassador chalets entitles guests to access a communal roof terrace and private patio area, in addition to satellite television, air conditioning, and luxurious ensuite facilities with corner baths. The Tankwa chalets come with the addition of a veranda overlooking the garden, and wood-burning fireplaces in addition to air conditioning. Finally, there are also lodge rooms. These come with a fireplace, veranda, television, and modern bathroom with a stand-alone shower. Another reserve worth considering if time is short, Fairy Glen is around an hour and twenty minutes (110 km) from Cape Town. The reserve consists of five luxury chalets (one of which is wheelchair accessible) and six standard chalets. The luxury chalets have a pared back design, with lounge area and kitchen, bathroom and shower. The double bed and two single beds in two of the chalets make it great for families, while the single bed/sleeper couch combinations of the others make it a good option for groups of friends. The standard chalets sleep a mix of two to four people, in a combination of double and single beds. While they include an en-suite bathroom with bath and shower, they do not enjoy the kitchen facilities of the luxury chalets. Are Safaris Near Cape Town Good? Opting to safari near Cape Town first and foremost means the ability to combine the incredible sights the city has to offer, and visits to its the nearby Cape Winelands, with the opportunity to gaze upon some of the world’s most awe-inspiring wildlife spectacles while minimizing the amount of travel necessary. This gives Cape Town’s game reserves a considerable advantage over other family-orientated safari destinations, and for those looking to minimize air travel. These reserves also act as a fantastic introduction to safari holidays, almost guaranteeing animal sightings, although they are perhaps less impressive for a seasoned safari goer used to more substantial unfenced reserves and national parks. Located in the arid Karoo region that surrounds Cape Town, the dry terrain of the city’s game reserves can support species such as impala and oryx, that are happier in drier conditions but struggle to support large populations of big game species without the need of add supplemental food for species including elephant. The game reserves we mention are also quite small when compared to the likes of Madikwe Game Reserve in South Africa’s far north, or Greater Kruger National Park, which includes the unfenced private reserves of those including the Sabi Sand. While this can be a positive in respect to animal sightings, it can limit the feeling of true wilderness for some holidaymakers. How much does a safari near Cape Town cost? Accommodation in game reserves is priced on a per person sharing basis, meaning if two people are sharing a double occupancy room they must both pay the quoted per person sharing the cost. In other words, a double occupancy room will cost twice the quoted per person price. If an individual occupies a room intended for two, they will have to pay a singles supplement, which is usually more than the double occupancy per person sharing price. Safaris near Cape Town start at R1800 ($130) per person sharing per night, to R2500 ($180) at the height of the December/January high season, for a standard room. The top safari locations in this region can cost anywhere in the region of R8000 ($575). With an early start, a safari is certainly possible as a day trip from Cape Town, especially if using your own road transportation and opting for one of the nearer game reserves we have recommended. When considering whether a day trip is worth it, bear in mind animals are at their most active at dusk and dawn, which might make staying for at least one night a better option overall. Some of the game reserves, including Aquila, also offer standard and private transfers for an additional cost, removing the stress of traveling on unfamiliar roads. On arrival at the reserves, guests transfer to open-sided all-terrain vehicles to maximize the safari experience. Children adore Africa’s animal life. However, it’s important to realize not every child will have the attention span to undertake a long game drive or safari holiday. Going on safari near Cape Town is excellent because it means you can mix up various activities (both while on safari and while in Cape Town) so that no one in the family gets bored or feels ignored. Another thing to consider is how well your children travel. If they’re not great road travelers, then one of the nearer game reserves is the right choice. Family lodges rather than standard rooms are also useful, ensuring you can enjoy your time on safari as a family. Having access to your own vehicle means you can head back to the city whenever your children have had enough. The best time to plan a trip to Cape Town is almost certainly between late January and late April. Coming at the end of South Africa’s summer, these months offer warm, clear days. However, thanks to its mild climate and temperate conditions, its also possible to visit Cape Town earlier, from October to January, extending the period when its possible to safari nearby. In contrast, the best time to visit Kruger National Park would be during the region’s dry season from late April until September, with the middle months being the hottest temperature wise.